Claustrophobia is a serious condition that may prevent patients from having a medically necessary MRI scan. Many people get nervous about the prospect of getting into an MRI scanner because of its reputation for being enclosed and narrow. Tell your doctor before your MRI appointment. There are a few things that he may be able to do to help such as sending you to a facility that offers a 1.5T open-bore MRI machine. He or she may prescribe a mild sedative to help you get through the test. If you do take one, be sure to bring someone who can drive you home. Ask for a 1.5T open-bore MRI. These state-of-the-art MRIs offer patients 70 cm of spacious headroom and are strong enough to provide extremely detailed images. With a 1.5T open-bore MRI, you won’t compromise quality for comfort. Inform the staff at the MRI facility. The staff at these centers are specially trained to help patients who fear tight spaces; they will talk to you throughout the scan and tell you what is happening to keep you calm. Keep your eyes closed during the scan. This will help to calm your anxiety and keep your breathing natural. You may not have to have your whole body in the MRI. Many scans, such as your foot, ankle and knee, do not require your entire body be in the scanner. This helps tremendously with feelings of being enclosed. Ask the MRI facility staff how much of your body will be in the MRI. Watch out for open MRIs that are lower-strength (1.0T or lower). The gold standard of MRI today is a 1.5T strength MRI because it produces extremely clear images for a very accurate diagnosis. A lower-strength MRI produces images where the quality is much lower. You want to take care that you are not compromising your diagnosis when choosing an MRI. See below for more detail on a 1.5T open-bore MRI vs. a lower-strength open MRI. Click here for more information on what to look for in an MRI machine, including a comparison of true open vs. wide-open bore MRI. Getting an MRI at Shields MRI? 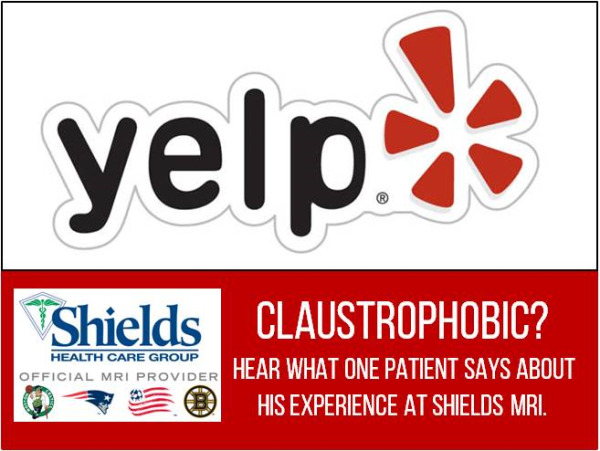 Shields MRI scans one in every three patients in Massachusetts and have a lot of experience with patients who suffer from claustrophobia or anxiety associated with enclosed spaces. We focus on minimizing your concern and successfully completing your scan. Open-Bore Technology: Throughout our network, 17 locations offer high-field, open-bore MRI machines, including two advanced 3T open-bore MRIs. These MRI machines have a 70 cm wide opening and a short bed, so most patients can be scanned with their head out of the machine for scans below the chest. If you are prone to claustrophobia or panic attacks, or are in any way concerned about how you could react during the scanning procedure, you should talk to your doctor about medication options and choosing the least confining MRI option for your scan, like one of Shields high-field open-bore MRI machines.